The City of Huron has partnered with Millennium Recycling, Inc. for single stream recycling. For questions on what can be recycled, search the site or send us a message. What can you recycle in Huron? Office paper, brown paper bags, paperback books, newspapers, magazines, flyers and junk mail. Staples and paper clips are okay. Cereal, tissue, dry food, detergent boxes, milk and juice cartons. Flatten boxes to save space. Soda, water, juice, cleaning detergent, shampoo, lotion bottles, milk jugs, margarine and yogurt tubs. Please remove lids. Steel, aluminum, tin, soup, tuna, empty aerosol cans and containers. Lids are okay if EMPTY. Grocery bags, bubble wrap and stretch film. MUST BE BAGGED: Place all inside clear bag or plastic grocery bag and tie shut. Shredded Paper. MUST BE BAGGED: Place all inside clear bag or plastic grocery bag and tie shut. ⊗ Huron does NOT accept glass in the recycling program. Did you know, 57% of everyone’s garbage is recyclable? All Huron residents have been issued a blue recycling bin. If you have questions about your bin or do not have one, contact the City of Huron. 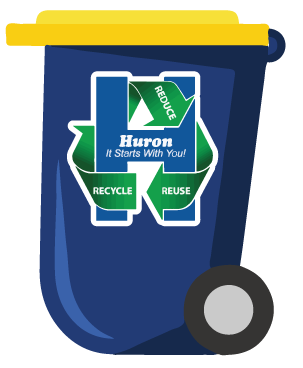 If your business or organization is interested in having a 20 minute informational presentation about the recycling program, contact the City of Huron. Help Huron go green. It’s the right thing to do!